Even if you don't know anything about the Robin Hood legend, Scarlet will introduce you to a point in history where a revered King--King Richard I--wasn't always in his homeland and his jealous brother Prince John essentially ruled and taxed the lands. It's the taxing that sets off a specific detail in the "Robin Hood" lore that remains constant in all variations of the story. He takes from the wealthy and gives to the poor. This interpretation of Robin Hood was so well though-out and had such heart-wrenching characters that it was difficult to hold myself back from learning everything I possibly could about Robin Hood and his men--in this case specifically, his "boys." This creative portrayal of his story was told through the eyes of "mysterious and moody" Will Scarlet, Robin's closest friend. Scarlet particularly focused on the teenage years of Hood's life and incorporated original back stories for some of the legendary "boys" known to be in Hood's circle. 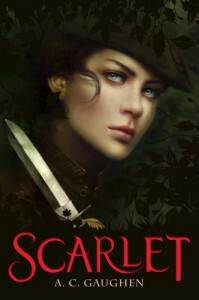 As the protagonist for this book, Scarlet was truly an interesting and decidedly stubborn character to read about. Right off the bat I could understand what Scarlet was going through at different intervals of the book and I liked that her background remained a mystery until she was prepared to reveal herself to her band mates. Her difficulty to hide who she was from most of the people she helped was a constant I enjoyed reading about. It made more of empathetic character to think that she did all these things, gave all this hope to an overly-taxed town and still remained but a visually fleeting glimpse in the people's memory. The only problem I had with Scarlet was that I wished she'd defend who she was and how she felt more clearly to her "brothers" because I would have liked to have seen their reciprocating reactions. Also her diction was something I had to get used but had trouble looking over because for every incorrect use of "were" instead of "was", I always had to backtrack and waste time trying to understand clearly what the heck she meant. However, in spite of this, I appreciated the easy-flowing plot and wide cast of characters, not only the boys but the people of Nottingham and the surrounding towns at the time. The villains in this re-telling had a front-stage presence in the book because they were never too far from anyone's mind and consistently inspired fear. As characters, the Sheriff of Nottingham and the thief-taker he hires, Guy of Gisbourne, were both well depicted and gruesomely terrifying. The love triangle between Robin, John and Scarlet starts somewhat instantaneously and I could see from the start that it was a bit of a domino-effect; one loved the other who loved the other. The internal conflicts were more interesting as tension was built, decisions were made, and uncertainties arose. The climax and brilliant ending will serve their purpose to incite pathos in the reader and establish a credible ground for any of Gaughen future works.